Dogs are a man’s best friend and as a best friend, I needed to get my Louie a really nice doggie bed. You wouldn’t treat your best friend bad, wouldn’t you? In fact, most pet parents will agree with me that splurging on our pet babies is totally okay. In a recent survey it was found out that over the course of owning a dog, about 56% of dog owners have celebrated their dog baby’s birthday. I honestly would skip meals just so I could buy Louie his food, monthly veterinary visits, and toys. I have owned dogs since I was little, our family always had one. Since moving out, I’ve had dogs of my own. I’m sure all pet parents can connect with me when I say the early stages is the most difficult. I’ve had to change Louie’s bed three times since he was a very active chewer. I was so grateful when I came across the Armarkat Pet Bed Mat (Click to view on Amazon). Since getting this dog bed for Louie, he has slept better and I never had to worry about it getting chewed up! Me – 1, Louie – 3. Progress! If you’re a new pet parent, whether this is your first baby or second or third, having a reliable doggie bed can save you from the trouble of countless changing. I’m sure being a pet parent can be stressful, don’t add the stress of looking for doggie bed reviews to your worries anymore. I have done the experiment, together with Louie, of course. I also took notes from those beds that he ever so eagerly destroyed with his chewers. It didn’t surprise me that this journey was very similar to when I reviewed crib mattresses. It was a tough research with a lot of trials and of course, errors. Nevertheless, Louie and I had so much fun getting him all those beds to try out. That said, I’m sharing with you the ten best doggie beds I found for under $150. Armarkat first ventured into the business of creating cat trees in 1994. Armarkat is a small company led by women that continued to expand their business into a multi-million dollar company manufacturing and distributing cat trees in the US, China, and Europe. To make their company a multi-million dollar venture, they did not only focus on manufacturing quality cat furniture and cat beds and has since then added dog beds and mats. They have doggie beds and mats for fur babies of different sizes. The Amarkat Pet Bed Mat makes me want to sleep in it. It has a soft plush and is made of canvas. This pet bed gave me my most needed and most wanted win against Louie in the battle of doggie beds. I also like how the color of the plush is light, which makes my Louie look extra cute when he sleeps in it. Even though I love the plush cover where my dogs lays down, but, maybe due to friction, even this material sheds! It’s great that I have the Bissell Pet Hair Eraser Handheld Vacuum but oh my, this thing really sheds. It did get me my win against Louie, but, watch out for the pet bed fur. Milliard is a big company of many businesses. They started out by selling candies and has included bed foams into their many lines of business. 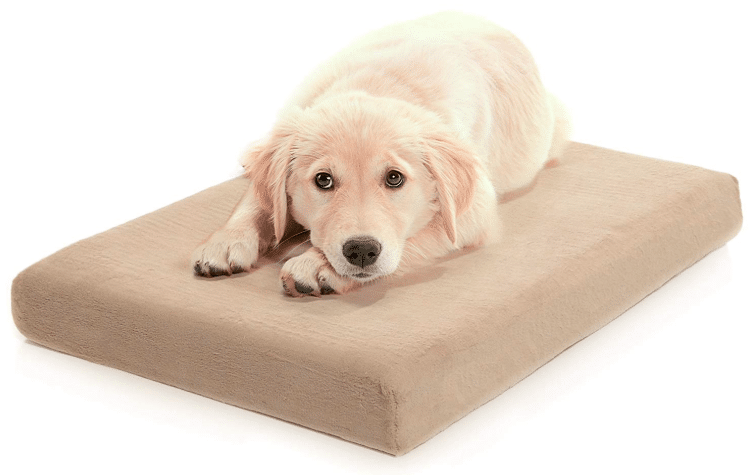 The Milliard Premium Orthopedic Memory Foam Dog Bed and Anti-Microbial Waterproof Non-Slip Cover is 4 inches thick of comfort and quality. 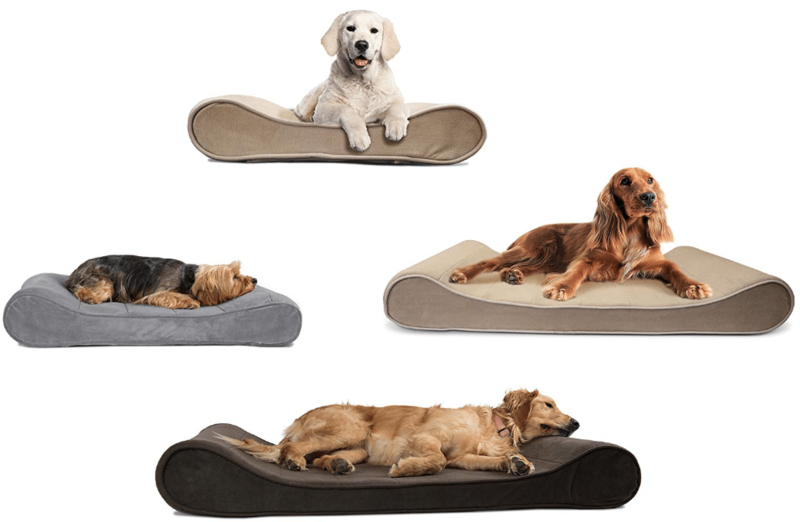 This memory foam dog bed comes in four different sizes: small, medium, large, extra large. I got Bella this memory foam even though he’s not an aged dog yet. I wanted him to experience what it must be like to sleep on a memory foam. Suffice it to say, he seemed to like sleeping on this one, that’s why it was my number two. He chewed on this, though. I don’t know if other pet parents have experienced this but I would often see my Bella sleeping on the floor in the middle of the night. I would often think that it might be because he went to drink water, but it has crossed my mind that the bed might have gotten a bit warm for him to sleep in. I think Milliard should look into the quality of the foam in terms of allowing some air pockets so the foam can also “breathe”. – The foam is four inches thick in total. Two inches of a sturdy foam topped by another two inches of memory foam. – A washable cover can be removed by a zipper. The FurHaven Pet Products company promises its buyers that their pet products are widely based on their personal experiences and observations. These are all aimed to improve the life of your pet dog or cat. They have cat playgrounds and perches, and beds for your cat or dog. The Orthopedic Luxe Lounger Pet Bed for Dogs & Cats belong to the thousands of available pet products on their listing. It comes in different colors and four different sizes. The Orthopedic Luxe Lounger has guaranteed their customers that they are only using safe materials for all of their product lines. Again, Louei is not an aged dog, I just want him to experience luxury just like how human parents want their children to experience the good life. The FurHaven is a great choice for “pawrents” who want the good life for their furbabies without hurting their budget. At less than $40 per piece, I think this is such a great buy for this price range. It’s really difficult to gauge and provide points for improvement for doggie beds. All I know is that this foam is very comfortable to sleep in. I did try to use this as a pillow when Louie’s bed came through in the delivery. I had to test it out for myself. But, Louie, chewed on this so, this wasn’t my number one. That said, I think the covers should be made sturdy enough. It pretty helpful for your fur babies, but Louie thought this looked pretty chewable so he chewed on it. My bad! They did say it wasn’t for doggies with teething problems. Best Friends by Sheri is a brand that took inspiration from a sleeping dog on textile swatches. This Luxury Shag Faux Fur Donut Cuddler made by Best Friends by Sheri is another luxury purchase all pawrents can afford. The makers’ goal: to improve the lives of the pets and their loving owners. 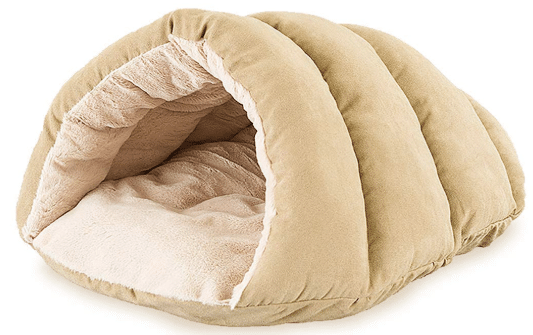 The donut cuddler is among the many of the pet beds available from Best Friends by Sheri. It’s cute and functional, what more can Bella ask for. I love how this doggie bed is shaped. It mimics the cuddling so I know that whenever I am gone, Bella can sleep soundly as if I’m carrying him. The faux fur is also a nice touch, it makes it look super expensive and the color makes a great compliment to Louie’s brown fur. I know how I complained about the Milliard memory foam bed foam thickness, but what this Luxury Shag Faux Fur Donut Cuddler had in terms of the cuddling and the luxurious exterior meant that the actual bed was sacrificed. It didn’t have much cushion for my poor Louie. The materials were okay, but Bella and I wish that they could have added a little more cushion for a comfier sleep. – The faux fur is very soft, it’s Louie & Bella-approved. Coolaroo is best known for their umbrellas and outdoor blinds. 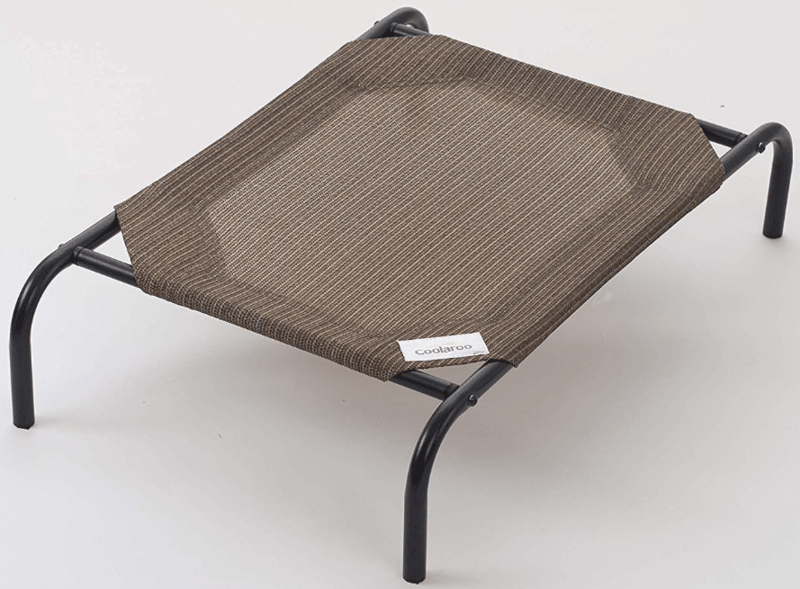 Coolaroo is a trusted brand for outdoor furniture including pet beds. Being an Australian brand, they know how hot summers can be and your pet deserves a cool bed to rest on when the heat rises. The Coolaroo steel frame pet bed is a steal at less than $30. Made from completely breathable materials, your pet can enjoy lounging outside all cool and relaxed. To be honest, this steel frame pet bed did not appeal so much to me when I was browsing for pet beds on Amazon. Despite that, I overlooked the aesthetic value because it looked pretty functional anyway. I got it and Louie loved it. It served its function as an outdoor pet bed. It may not look much but, it’s very functional and served Louie really great. If I were to change something from it, I would like to have some aesthetic value added to it. – Made to withstand flea, ticks, mites, and even mold and mildew. Ethical Products has been in the business since 1952. I took the time to review and purchase this one because I thought Bella would enjoy having a bed that took the shape of the cave. I know Bella was comfortable when we had this around the house because he did not stress chew on some of my furniture. I felt, however, that the cave opening should have a sturdier frame. As a pawrent, it stressed me out thinking that the cave would swallow up Louie! Another thing that the manufacturers can probably look into for the next generation of the sleeping cave would be the base of the structure. It feels a little too thin, so this might not be a good option for larger dogs. – Great for XS to S dogs. Barks Bar is a company that aims to put all of our pets needs as their top priority. Whatever activity that our pets are involved in, napping, feeding, or traveling, BarksBar guarantees its consumers that there’s something for all of their needs. They have a wide array of products which include car seat covers, accessories, and comfortable dog beds. 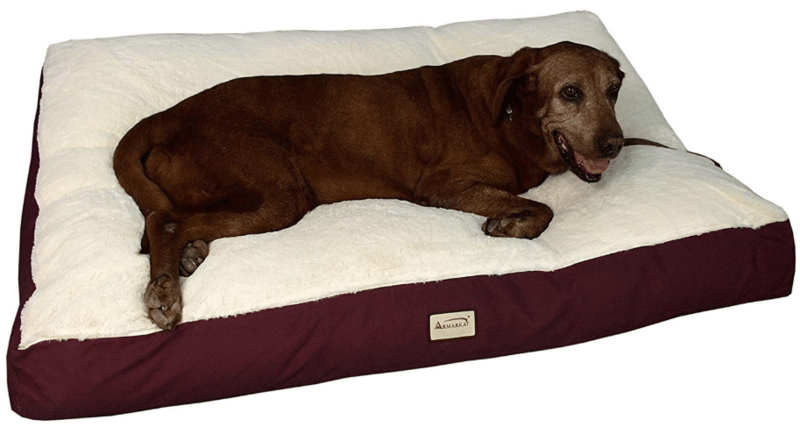 Their snuggly sleeper is an orthopedic bed that helps dogs that have sore joints and arthritis. The grooved orthopedic foam also helps in aligning your fur baby’s spine. When I first saw this on Amazon, I thought that it looked so formal. “Wow! A formal dog bed!” So, of course, I had to have it delivered and tested out by Louie. Louie doesn’t have much fat, being a toy Schnauzer and therefore he needed some nice bed. Yet again, despite the price and quality of this bed, it lost to Louie’s chewers. I told myself, even though it was really good, I couldn’t afford a $73 chew toy. As I said, Louie managed to chew off the cover. I think BarksBar could look into having a different material for the cover. A little sturdier that can’t be penetrated by chewing nor scratching. – Ideal for doggies suffering from joint pains or arthritis. – The cover is made from polyester, has 4” orthopedic foam base, a cotton-padded rim that follows the curve of your fur baby’s neck. Best Pet Supplies, Inc is a supplier of superior-quality pet products at the price you can afford. Their product lines include plush toys, feeding supply, waste management products, pet stairs, and of course, pet beds. They pride themselves in having the ability to provide pet owners whatever product that they will need in order to take better care of their furbaby. 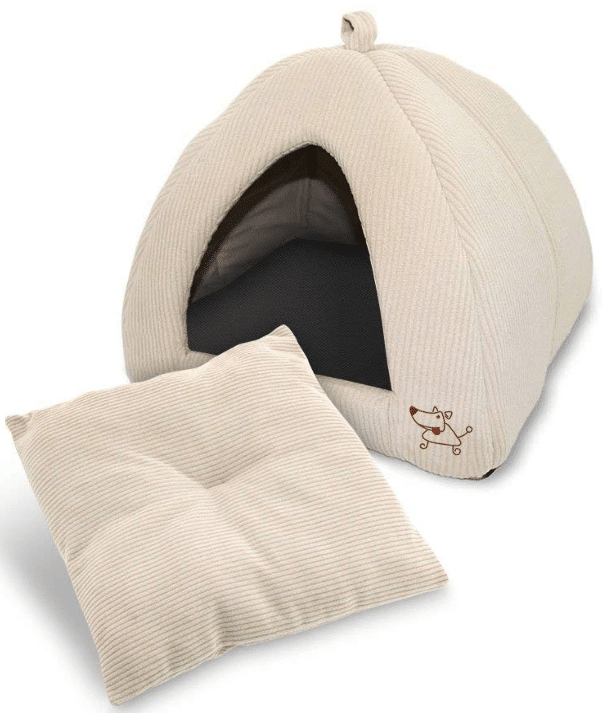 The pet cave/tent bed for dogs is a cute bed for your doggie to sleep in. It uses linen, faux suede, and/or corduroy. Completely machine washable and comes in different colors. I had to buy this for Louie because I’ve seen one of these on the infamous cat game on my phone. I thought I could make Louie look cute in this pet cave. He did! I got him the plaid linen to match his “personality”, he is a toy Schnauzer anyway. I thought he would look cute in the linen. I understand that these dome-type beds/caves should use really soft materials. Sturdiness is often left out. Sadly, after washing this twice, it lost its form. – All of the colors available won’t make your dog’s cave from Best Pet Supplies, Inc stick out and cause an eye-sore against your interior. They’re all good-looking and comes in different colors from light beige to dark brown to blue. – Dimension is measured at 16” x 16” x 14” (for medium), extra large is at 19” x 19” x 19”. Extra large can fit any medium sized dog or an adult jack russell. – Whole pet tent is machine washable. With its headquarters located in Colorado, K&H Pet Products provide different kinds of pet products to dogs, cats, and even to domesticated chickens. Their source of pride? The technology they embed in their cooling or heating pet beds. The heated bed is MET Safety-listed. This means that the product complied to the US and Canadian electronic products safety standard. 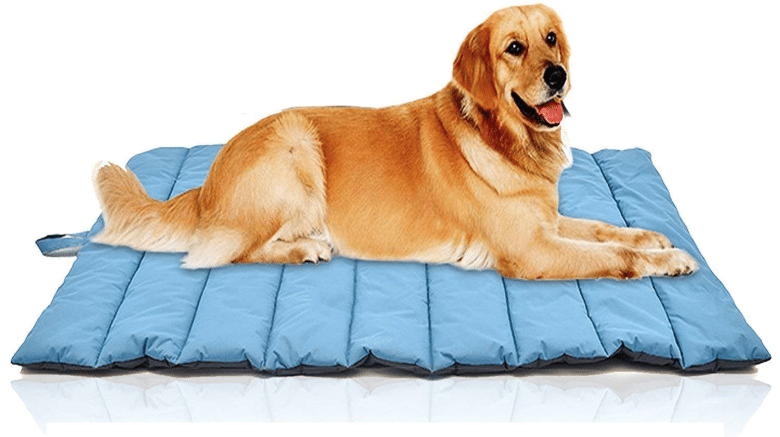 The heated bed is great for pets who are often craving warmth or for aging dogs who are suffering from joint pains. I have my apprehensions with electronic heating gadgets for beds. I feared that it could hurt my Bella and I wouldn’t want that. For the time that I allowed Bella to sleep on this heated bed, he was very comfortable. But, like the Milliard, I would often catch him sleeping on the floor then going back, which I assumed was an indicator that the heat became too much for him. I just really stopped him from using this because I feared electrical use on my dog. K&H could probably look into fixing the heating element of this bed. It wasn’t very consistent. Also, the covering material seemed to not be weather-proof which means it might not be good for outdoor use. – You can clean the cover by wiping it with a rag and the fleece is machine washable. GoWild Pets is an Australian-brand known to create and supply products to bird lovers. They are also venturing out to create doggie pet products as seen in this oversized cool pet bed mat. Designed for when you would go trekking with your fur baby or have a nice day outside. 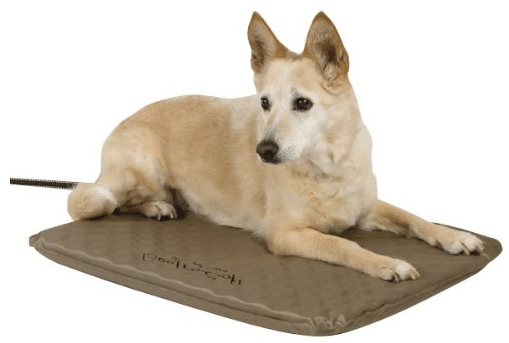 The outdoor travel dog mat is soft and comfortable enough even when the surface is not flat. It’s also easy to clean too, which is perfect for its purpose. I needed to buy an outdoor mat for Louie for when we will be out in the beach or when we’re trekking. This pet bed mat was the perfect companion for our outdoor adventures. It was very soft, which was what Louie exactly needed. With the price tag, I didn’t even think twice. It was big for Louie so, he was able to share the comfy space with his other friends. I loved that it could be conveniently packed in a carrier of its own. At less than $30, it was a great buy! It’s value for its price, I couldn’t say anything to make it better considering its price tag. I guess they could add a little more puff to the cushion. – Waterproof and made of sturdy, environmentally-friendly materials. – Durable enough to withstand scratching. – Really easy to clean! – Know your dog’s weight and accurate dimensions. Dog beds are made in different sizes. Both Louie and Bella only weigh about 8kg and are not that tall, they are Toy Schnauzers! Having said that, do be aware of the dimensions of the bed you’re buying to save you from the headache of returning products. – There are indoor beds and outdoor beds, it’s best that you know where you will place the beds so you will have an idea of kind of material it should be made from. – Last tip, washing and care guide. Buying a dog bed is similar when you’re buying clothes. Knowing how to clean it will save you from buying and buying the same item just because you did not know how to properly care for it.